Preheat the oven to 375 F. Wrap beets tightly in foil (about 12 beets per foil package). Roast for one hour and 15 minutes. Remove beets from foil, allow them to cool, and peel. Cut the peeled, cooked beets into bite sized pieces. 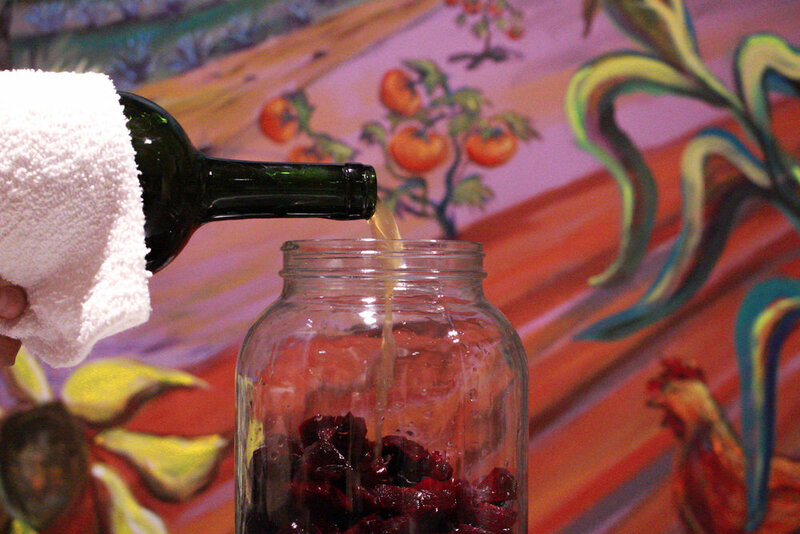 Place the beet pieces into a sanitized glass jar. Pour vinegar to cover the beets and close the lid. Any raw, unpasteurized, probiotic vinegar such as, apple cider or kombucha vinegar will work well; you can buy raw probiotic vinegar from Casper Fermentables at the SFC Farmer’s Market Downtown on Saturdays. Leave the beets to ferment in the jar at room temperature for 3-4 days and then move them to the refrigerator. The pickled beets will last in the fridge indefinitely.